What is the Double Data Weekend promotion? How long can I enjoy Double Data Weekend Promotion? This promotion is a limited time offer. Cycle 1 customers (billing period begins 1st of the month) can enjoy this promotion starting December 1st. Cycle 2 customers (billing period begins 15th of the month) can enjoy this promotion starting December 9th. Please note that the Double Data promo allowance refreshes with the billing cycle. I have a DigiNet Free Mobile PostPaid Plan (DigiTriple Lite Plan), do I get Double Data Weekend Promotion? How do I sign up for this promotion? No subscription needed. Your promotional data is applied automatically. Is there an additional charge for this promotion? No, there is no additional charge for this promotion. When can I use my Double Data Weekend promotional data allowance? Your Double Data Weekend promo data can only be used from 12:01am Saturday to 11:59pm Sunday. Do I receive an equal amount of data every weekend? No, you receive the full double data allowance on the first weekend of your billing cycle, and any unused data allowance will rollover to the following weekend within a billing cycle. The promotional data allowance will refresh with each billing cycle. A Lite Plan customer will receive 12GB for Double Data Weekend promotion on weekend 1, if the customer consumes 10GB during weekend 1 then there will only be 2GB available for weekend 2. If 2GB is consumed on weekend 2 then there is no Double Data Weekend balance for weekend 3 and customer will be reverted to plan data or add-on, if applicable. What happens if I have a data add-on? Double Data Weekend promotion takes priority over the standard plan data and add-on (one-time or recurring) on weekends. Will my Double Data Weekend promo roll over each billing cycle? No, the data allowance will not roll over. Any unused data allowance will be lost. 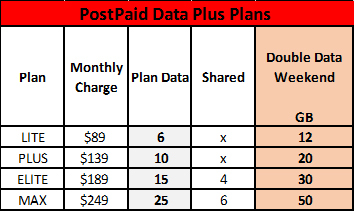 If I have a shared plan, how much data does each member receive? Similar to your plan data, your Double Data Weekend promo will be shared amongst all members. As a shared member, can the Double Data Weekend promotion be shared with only PostPaid members? No, data can be shared with either PrePaid or PostPaid members. How can I monitor my promo data usage? Customers will receive notifications via text at 50% and 100% data depletion. Call us at 119 anytime of the day or send a text message or WhatsApp to 608-8888 between the hours of 7:00 am to 10:00 pm.